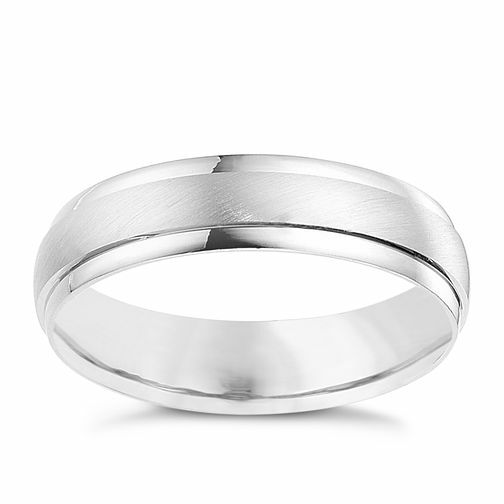 Men's 9ct white gold 5mm wedding band combining a matt and polished finish. 9ct white gold 5mm matt and polished ring is rated 4.0 out of 5 by 3. Rated 5 out of 5 by Anonymous from Beautiful! After searching for the perfect wedding ring for months, I went past a shop window and seen this beautiful ring when I was in a rush - having no time to go back, I went online and found it so easily! Like it was meant to be! Ordered it online and it arrived the perfect fit. One happy bride to be!! Rated 2 out of 5 by Anonymous from Matt portion all scratched after a week I got this ring for my 14th Anniversary to replace my original yellow gold band. Just after a week, it has scratches on the matt portion. My original 9ct, 14 year old, yellow gold ring still looks like new! It could be my lifestyle - but how careful can one be? I only have an office job, but I don't take off my ring when i do house chores. I just wonder if i can still take it back with all the scratches.